If you’re a Robocraft player, now is the time to head back to the workshop and start tinkering with your mech. The seventh free update to the game – Maximum Loadout – has been launched, and it brings two massive new features to the game that adds a new angle to combat. 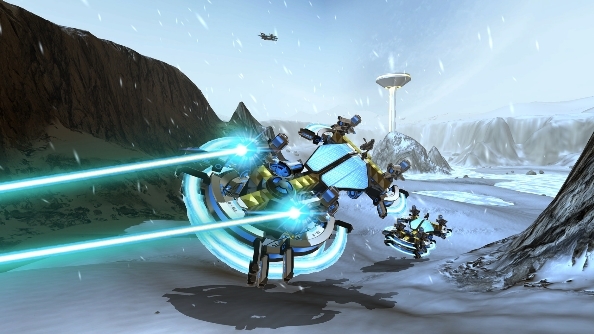 Robocraft is just one of many amazing free PC games. Live weapon switching now allows you to mount multiple weapons to your robot and switch between them in battle. This means you can bring in a variety of offensive systems to account for various different scenarios. No longer must you pick between missiles and lasers; provided your Power Bar can cope, just take both! Weapon switching is joined by Combat Modules that work akin to power-ups. When installed, the modules allow your mech to use special abilities in battle. The first two to be introduced in the game are Blink – a teleport skill that sends your robot instantly to a selected point on the map – and a Disc Shield that keeps players within it safe from enemy weapons. The Maximum Loadout update also tweaks mechanics and balances out any problems that were affecting the game. You’ll find that weapon projectiles are now tracked more accurately for better combat. The update has already been applied by developer Freejam, so just jump onto the servers now to get started with the new features.